The beauty of nature has long captivated man, but the relationship many have with nature is largely optical. America has no shortage of stunning sunset, snow-capped peaks and intriguing rock formations, all of which inspire snapshots and persistent visual memories. There is also a more intimate side to nature, which I seek to capture in my sculptures and wall pieces. My work is fundamentally hands-on, created on-site through the use of trees and other forest dwellers via the technique of repousse. Through the use of a gas-powered air compressor, hundreds of yards of hoses and an extensive toolbox, aluminum is hammered, stretched and tightened around natural objects to sculpt the skin of the forest. This fictitious surface does not mimic or recreate nature, but rather pushes nature’s intrinsic qualities to the surface. There is intimacy, anthropomorphism and mythology in the woods, and by becoming art, there is also machinery. The resulting works investigate the divide between representation and abstraction, stripping nature’s unique imprints of their color, detail and texture. This abstract quality is further advanced by the explicit cropping of the art and its displacement from its original environment. While I work primarily in a forest along the Appalachian Trail, I have also worked in the Adirondacks, the Berkshires, Nova Scotia and California. Before I can begin working in a space, I must familiarize myself with it and find an idea grounded in that space. Even an acre of forest can provide a lifetime of inspiration. My work comes out of classical sculpture, including minimalist art and modernist sculpture, and begins with process, with the idea of hammering aluminum around trees and condensing all that detail on the skin. The process continues in the studio, where the metal molds are assembled, heat-treated and sometimes anodized. 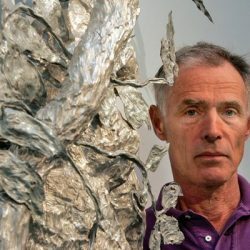 I have been working with aluminum for nearly 40 years, when I felt a desire to incorporate the vastness of nature, both the way it looks and the way it might feel, into art. Nature abstracted as such is ideally hard to conceive, like a riddle that keeps coming back into your head. There is something that you cannot identify or define, but that you have to touch. It can’t be recreated, and each time you touch or view it, it seems different. And there is something about grasping this in a tactile way that people relate to.